Thanks to all those who voted in rounds 1 and 2—which has so far added up to about 6,000 votes. Despite the large number of votes, many of these matchups have been decided by slim margins. In the previous round, a single vote twice separated the competitors. 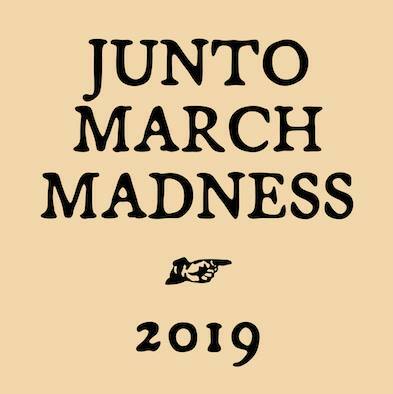 Today, voting begins for the third round of 2019’s Junto March Madness tournament. Voting will end on Friday at 5:00pm (EST). As always, take the opportunity to explore some of the digital history projects that you aren’t familiar with (and check out the entire field while you’re at it). This tournament is intended to highlight early American DH projects for unfamiliar audiences. As you vote and discover, use the hashtag #JMM19 on twitter. « Junto March Madness 2019: Round 1 Winners and Round 2 Voting!